The Trail Grant Committee is pleased to provide you with the Trail Grant Guidelines and Application for 2019 in the links below. Please print them out, complete the application and send it in by February 1, 2019. ALSO, a reminder to 2017 Trail Grant recipients....please send your completion reports in by December 1, 2018. Thank you! These grants are meant for public equestrian trails or shared use trails which include equestrian riding/driving. The grants are awarded in two distinct categories, new trail development and trail improvements, enhancements, or repairs. The money cannot be used for routine trail maintenance, administrative or operating expenses, trails on private property, non-equestrian trails, food for work days, thank you gifts or awards, or liability insurance for volunteers. See the Program Guidelines for specific information. Applications must be postmarked by February 1st. Completion or Interim Reports must include the Volunteer Log Sheet and are due by December 1st. Contact the Program Coordinator for more information or with questions or contact the WHC office. Please click on the links below to see all of the funds that the WHC Trail Grant Committee has given out over the years! In 1998 Wisconsin Horse Council Trails committee started a trail grant program that has since grown to more than anyone expected. 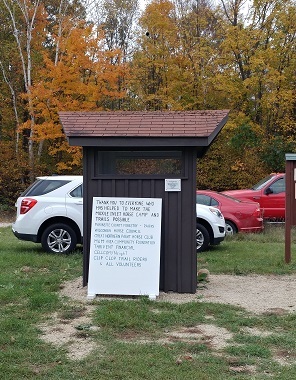 Since that first year when a total of $3500 was given out for 6 grants in 4 parks including Underdown , Oconto County Forest, Ahnapee Trail and Yellowstone. The program has been beneficial to countless parks around the state. During the 17 years Wisconsin Horse Council –Trails Committee has awarded $260, 521 for improvement on our trails. Each grant recipient must match the grant with at least 50% in kind amount. Just doing the math that is $334,121. But wait it gets better! Many of the projects that have been undertaken far exceed the 50% match, making that total closer to a half a million dollar in improvements to the public equine trails in Wisconsin! In working at Midwest Horse Fair, we promote joining the horse council, and the most frequently asked question is - What does Wisconsin Horse Council do for me? This $500,000 is only a small part of the contributions of WHC to the equine indus-try, but the results quietly affect many in a positive experience on the trails. It was a tough year for grants this year, the Trails Committee had the difficult job of cutting $32,650 in requests down to awarding the $17,000 we had available. Watch for things to be changing in Gibbs Lake, Horseshoe Falls, Underdown, Narrow Gauge, Duck Egg, Southern Kettle Moraine, Halls Creek/Bush Lake. Please be sure to contact the friends group of your local park, and see if there is anything you can do to help out! With all of the potential budget cuts, we all are going to have to step up and make sure that our trails stay in good shape for our use! Many people I meet as a member of the Wisconsin Horse Council Trails committee representative express a concern about what the horse council and particularly the Trail’s committee does for them. One of the Trail’s committee tasks is to partner with local horse clubs to assist with the development and improvement of Wisconsin’s horse trails. We do this by awarding grants to local clubs for projects that they then implement. This past summer as I travelled about the state camping and trail riding, I decided to take some pictures of an assortment of projects from grants that were awarded in the last two years. Our first stop was at Horseshoe Falls in Dunbar, Wisconsin. Northern Saddle Club maintains this trail and campground. 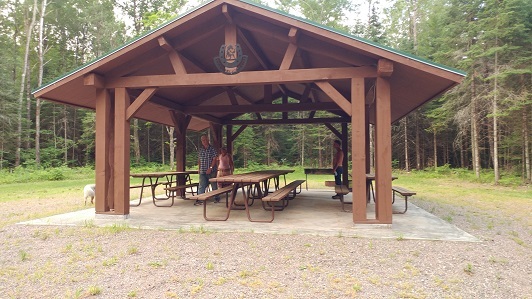 Over the years the Wisconsin Horse Council has awarded grants to the club for various projects such as expanding the campground, improving the entrance road, signage, and campsite amenities like picnic tables and fire rings. 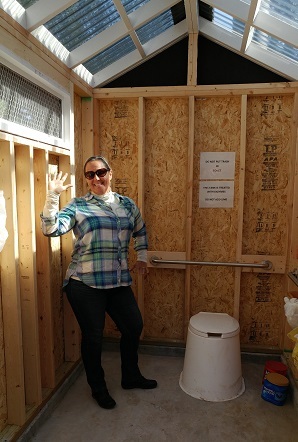 This time we were here to look at the new pit toilet we had helped fund. As my friends Patty and Carol said, “this toilet is a palace!” It is actually one of the most luxurious pit toilets I have ever seen. Go check out this trail system. It’s well worth the drive. The next stop was at Governor Knowles State Park in the northwest corner of our state. We stayed in the Trade River Campground which is a large and well appointed campground. The Equestrian Friends of the Governor Knowles state park had applied for a grant to repair part of the trail that had washed out. My riding partner, Patty, and I hit the trails to find the area that had been repaired and knew exactly when we found it as there was a sign acknowledging the Wisconsin Horse Council’s assistance with the project! The club did a wonderful job with repairing and making sustainable the section of trail that was on a slope. The Underdown Recreation Area in Lincoln County is a favorite place to camp and ride. 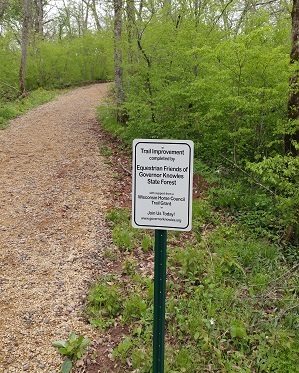 The Underdown Horse Club, Inc. maintains the trails and makes camp ground improvements. The horse club has been recipients of a few grants from the Wisconsin Horse Council. One was for partial funding of a nice group shelter which is available for public or private gatherings. Another was funding for a pump for the well to supply water for horses. It’s always great not to have to haul water for the horses when camping. Lastly, we go to the Middle Inlet Horse Trails. The Clip Clop saddle club has spent the last two years developing this new trail system and have done an impressive job. From signage, picnic tables, high lines to a new pit toilet, this club has done wonders. The Wisconsin Horse Council has been proud to help partially fund these projects. This horse club is in the process of digging a well to provide water in the camping area. These are a few projects that the Wisconsin Horse Council has partnered with Wisconsin horse clubs on. Money well spent in my opinion. I would like to encourage all of you to join in supporting your local horse club. You can do so by joining the Wisconsin Horse Council and working towards horse concerns statewide or by joining your local horse club to provide sweat equity on the many chores required in maintaining your local trail. Your participation would be appreciated by the horse clubs as well as the trail riders using the trails.